Ingredients (to serve 2), in order of use: sesame oil (~2 t.), eggs (2), canola oil, (~2 T.), scallion (2 large, white portion finely sliced, greens separated), sliced garlic (2 cloves), green bell pepper (1/4 pepper, coarsely diced), carrot (1, sliced), green cabbage (1/4 small head, thinly sliced/shredded), fresh black mushrooms (~6, sliced), sticky rice (2 servings, leftover), ground black pepper, soy sauce (~2 T.), fish sauce (1 t.), rice vinegar (1-2 t.), honey (~1 t., disolved in sauce and vinegar), shrimp (for two servings, e.g., eight 31-40 count), scallion greens (coarsely sliced). Scramble the egg first, in sesame oil, remove it and return near the end. Stir fry these ingredients (e.g., in a 12 in. cast iron skillet) over medium-high heat, added in the order above, adding the next ingredients as the prior cook to the desired tenderness, e.g., bell pepper and carrot at same time, musrooms and cabbage at same time. With leftover sticy rice, return it to approximately room temperature (microwaving is fine), wet hands with water and break it up in a bowl, and sprinkle it with black pepper, prior to adding to the strir fry. For the shrimp (thawed in water, from frozen), chop or leave them whole (as shown here), peeled but left with the tails intact for color. 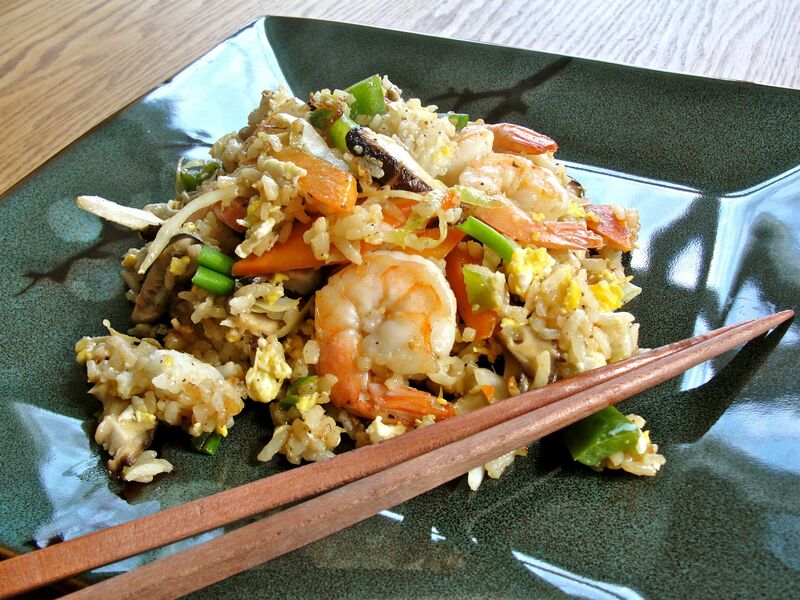 To cook, place shrimp under the fried rice in contact with the pan, turning shrimp to cook evenly, and remove fried rice from heat when the shrimp is just cooked through after just a few minutes.